A stealthy, silhouetted shadowy ninja figure suddenly bursts onto the scene – playing a viola! It’s Viola Ninja! 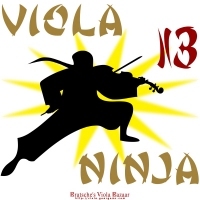 A cute design for violists, viola students or teachers, ninja fans – all of the above! Buy this design now, exclusively from Bratsche’s Viola Bazaar, on various apparel and giftware items including t-shirts, hoodies, clocks, bags and mugs.